As the process name implies, an Electroless Nickel deposit is not the result of a standard electroplating process, but rather the result of a chemical reaction that deposits a coating of Nickel and Phosphorous on this surface. The reaction is autocatalytic: once it starts, the presence of nickel acts as a catalyst to keep the reaction going. Deposit thicknesses can range from a few microns to 100 microns. Most media storage disks in computers are made of Aluminum and plated with Electroless Nickel. Many other components such as on connectors also find electroless nickel to be a very useful finish. As an undercoat on many decorative trim pieces that are made out of Aluminum (subsequently Cr plated). Also used for wear resistance on brake components and gears in response to the need for longer warranties. Primarily used for corrosion resistance, although wearability is also a consideration. Valve components, pumps and pipe fittings are typically electroless nickel plated. Used for mixing blades, pumps, etc. Equipment components of all types. Electroless Nickel deposits are divided into three categories, based upon Phosphorous content. Hi-Tech offers Medium Phosphorous content Electroless Nickel. Because the deposit is the result of a chemical reaction, uniform deposits are obtained over all surfaces. The Phosphorous content makes the deposit somewhat self-lubricating. As a general statement, the lower the Phosphorous content, the higher the as-deposited hardness. However, the lower the Phosphorous content, the lower the corrosion resistance. All Electroless Nickel coatings can be hardened by heat treatment after deposition. Nickel Phosphide forms through a process known as precipitation hardening. 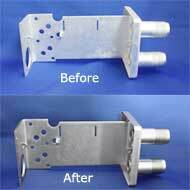 Hi-Tech Plating specializes in plating Electroless Nickel on Aluminum. Medium Phosphorous deposits are utilized to impart wear and corrosion resistance to the Aluminum for the electronics, aerospace and medical industries. 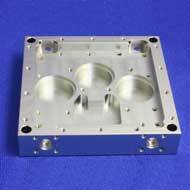 Hi-Tech Plating specializes in the MIL-C-26074 electroless nickel plating process as well as AMS-2404, AMS-C-26074, and ASTM B-733, ensuring the highest quality results. Hi-Tech Plating runs RoHS compliant cadmium and lead-free Electroless Nickel. The first patent on Electroless Nickel plating was granted 1916. However, Brenner and Riddel are generally credited with publishing the first article on practical Electroless Nickel plating in 1946. Since then, all other developments have essentially been refinements of their initial process with the basic chemical reactions remaining the same. Nickel-Boron is another commercially available form of Electroless Nickel that has found limited use for special applications only. Electroless Nickel can be plated onto metallic powders. Electroless Nickel can be co-deposited with Teflon and other particles to produce unique coatings. In addition to Nickel: Copper, Silver, Gold, Palladium, Tin, Indium, Iron and Cobalt have all been chemically deposited, but only Copper is run commercially.